International architectural practice, Aedas, has been named the winner of an international invited design competition for the Abu Dhabi Investment Council Headquarters. Competition entries were invited from a select list of practices with the objective of producing two landmark towers to accommodate offices for the Investment Council, providing working, private amenity, dining, conference and meeting spaces for over 2,000 employees. The clients’ brief was to provide a pair of outstanding landmark buildings of the highest architectural quality reflecting the standing and prominence of the Investment Council. 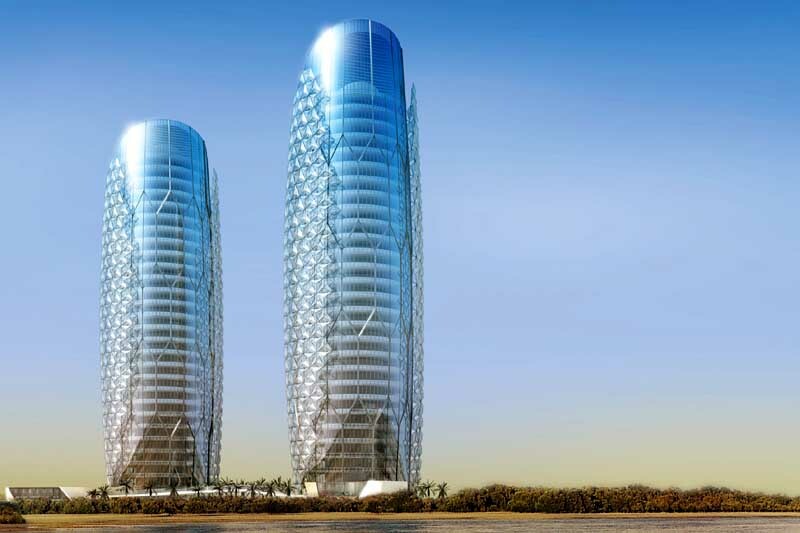 The two Abu Dhabi Investment Council towers occupy two neighbouring sites, located within close proximity to Al Qurum beach in the eastern district of Abu Dhabi. Prominently situated along the Eastern Ring Road, the buildings will act as landmarks to the gateway of the city. A paramount consideration for the proposed design was to set new standards of environmental responsibility which are entirely consistent with the Governments aspirations to become a global leader in this area. 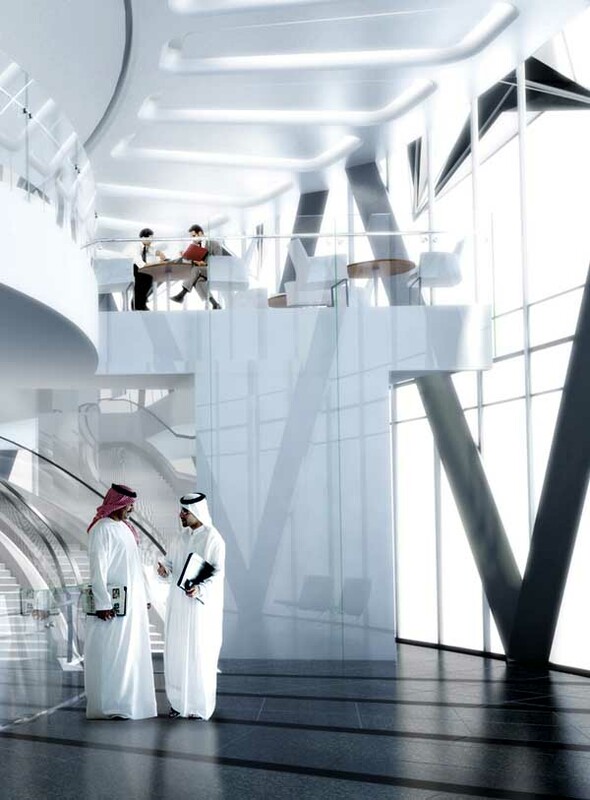 “Our concept for the Abu Dhabi Investment Council headquarters was generated from a mathematically pre-rationalised form which was in turn derived from Islamic principles” said Aedas Joint Managing Director, Peter Oborn. “A key feature of the design is the application of a diaphanous screen that envelopes the most exposed aspect of the building in the form of a dynamic ‘Mashrabiya’, opening and closing in response to the sun’s path, significantly reducing the solar heat gain and providing a more comfortable internal environment. Aedas’ in-house Research & Development Group worked in collaboration with the Aedas architectural team to develop advanced methods of computational design that have resulted in the practice’s unique, mathematically-derived solution for the tower buildings. The buildings’ crystalline, honeycombed structure is based on an underlying geometric pattern that has resulted in highly efficient load paths and a structural solution that is stable, flexible and economical. 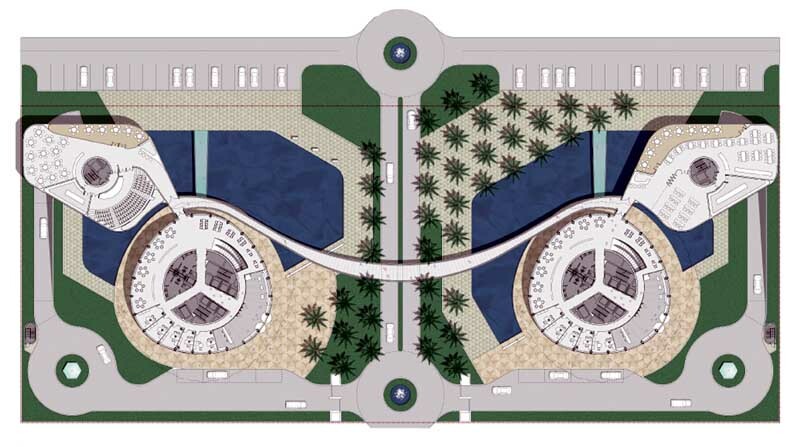 Landscaped external spaces including a palm reserve and water features link the two towers via elegant pedestrian pathways. The elevations of the building are punctuated by three sky gardens arranged on the upper levels of the towers, further reducing the solar heat gain on the most exposed elevation. Planned development for the Abu Dhabi Investment Council project will transform a total site area of 11,500sq m. with a unique architectural design that will meet the aspirations of the client and the city of Abu Dhabi. “We are delighted to have been selected as architects for this project and to be given the opportunity produce an exemplar of sustainability for such a prestigious client.” said Peter Oborn, Project Director and joint Managing Director at Aedas. The Abu Dhabi Investment Council headquarter buildings rise to a total of 29 floors and stand at over 140 metres. A total ground floor area of over 32,000sq m. will accommodate commercial office use, as well as facilities for a full-service restaurant, café, a fully configured auditorium for up to 150 people and a multi-use conference space. The site area is 11,500sqm. The Mashrabiya screen solution has responded to the United Arab Emirates’ aspiration to become a leader in the field of alternative energy, as evidenced by the recent Masdar initiative. 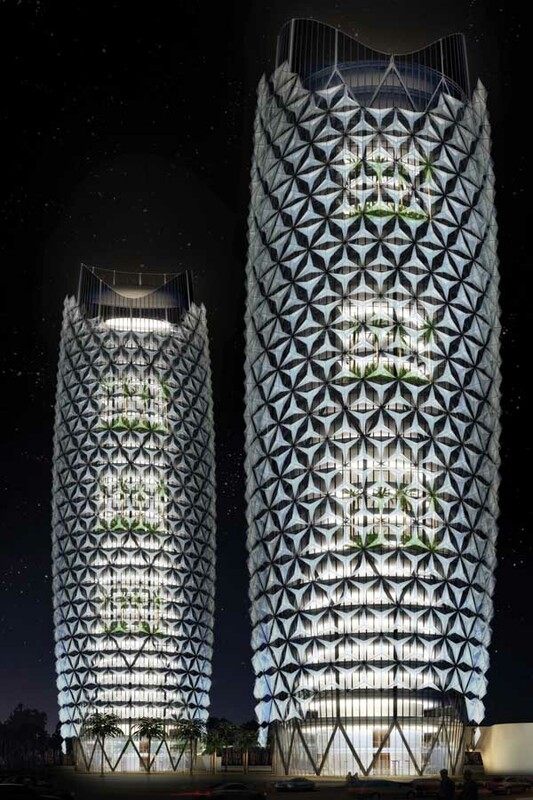 Preliminary estimates suggest that the screen will result in a 25 per cent reduction in the cooling load, thereby substantially reducing the carbon footprint of the Abu Dhabi Investment Council building towers. The Mashrabiya will comprise a series of components, each of which will open and close in response to the sun’s movements ensuring solar gain is minimised at all times and contributing to glare reduction. This solutions may also result in the specification of glass to be reduced, providing a more economic solution. The design concept seeks to deliver the clients requirement for two landmark towers to accommodate the offices of the new Investment Council together with the Bank’s new Headquarters. 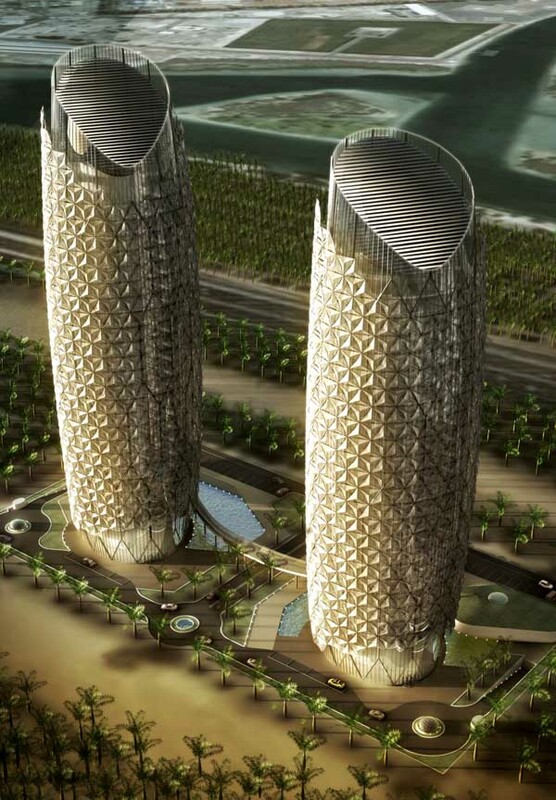 The two towers occupy neighbouring plots on two adjacent sites situated close to Al Qurum beach in the eastern district of Abu Dhabi. Defining Geometry: In order to provide a framework upon which to develop two separate but related buildings on adjacent sites, a geometric pattern has been conceived, derived from Islamic composition, from which all other aspects of the design have been developed. The resulting geometrical framework, when applied to the towers results in a parametrically based, ie mathematically rationalised form, allowing the design to be developed with precision and accuracy. Building Form: The forms of the Abu Dhabi Investment Council headquarter buildings are generated by the defining geometry which is used to anchor the base of the towers while the asymmetrical plan form provides each tower with a natural orientation which is further exploited in the sculptural form of the towers and in their function. In order to provide a distinct form, the profile of the tower gently expands and then diminishes until it reaches its apex some 140m above ground. Structural Solution: A crystalline/honeycombed structure has been derived from the underlying geometry that provides highly efficient load paths and creates a structural solution which is at once stable, flexible and economical. The structural form also embodies a high degree of redundancy which would be very resilient if damaged. The Abu Dhabi Investment Council building superstructure is expressed on the external face of the building reflecting the underlying geometrical framework. 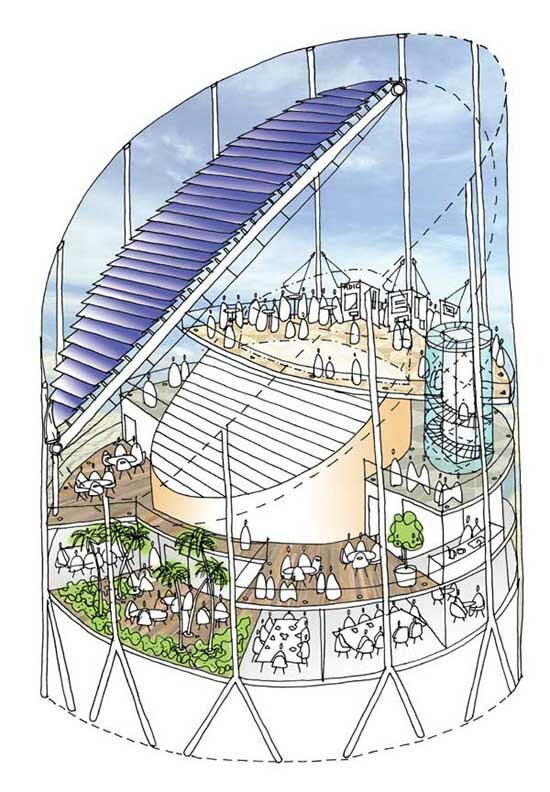 Sky Gardens: In order to further reduce the potential for solar gain, the form has been sculpted to provide sky gardens in what would otherwise have become the most sensitive areas of the building. The sky gardens also provide visual relief for users of the building and an important amenity space for staff during the cooler months of the year. Roof Form: The sculptural form of the tops of the towers has been driven by a desire to take advantage of the sloping southerly aspect to apply a skin of photovoltaic cells whilst simultaneously maximising the more sheltered northerly aspect providing open views towards the sea. The tops of the Abu Dhabi Investment Council headquarter building towers are differentiated in such a way that the Investment Council is provided with a double height space on the 29th floor suitable for holding receptions thereby also marking this as the more prominent of the two buildings. Preliminary estimates suggest that the photovoltaic panels are likely to contribute circa 8.5 per cent of the buildings electrical requirement thereby further reducing its running costs together with its carbon footprint. Approaching the site from Eastern Road, the Abu Dhabi Investment Council headquarter tower will be seen to the right across a large body of water and the Bank tower to the left will be seen behind a plantation of large indigenous palms. Access to the site will be security controlled and drop-off points provided at each tower. Further access to the under-croft will allow VIP drop-off, parking and double-height passageway for service delivery and refuse vehicles. The ground plane will be surfaced in high quality stone paving materials, chosen for their quality and longevity, and will be detailed to the highest standards. The geometrical framework referred to above has been rigorously applied to the external landscape which comprises a mixture of surface treatments with expanses of water provided to allow uninterrupted views of the building together with cooling reflections of the towers. We would also envisage the introduction of fountains to provide a dynamic backdrop on ceremonial occasions. The soft landscaped areas comprise formal arrangements of mature palms which unite the site with the surrounding nature, while the hard landscaping is also formally arranged. In order to control and maintain the visual appearance of the site all parking is managed either off-site or below ground with only limited drop-off facilities allowed at ground level. All servicing is also undertaken below ground. The two adjacent sites have been linked physically by ground level surface treatments and at high level by an elegant pedestrian walkway giving access between the two towers. By locating the towers towards the centre of the plots and ensuring that the site is left as open as possible we will ensure that the setting of the towers is preserved even if the surrounding area should one day be developed. The Abu Dhabi Investment Council headquarter buildings accommodate 1,000 people in each tower, for which space standards have been derived from the British Council for Offices BCO guide.